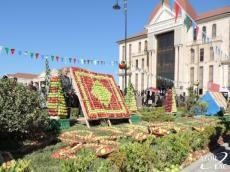 Different kind of tastiest, crispiest, juiciest apples decorated the 5th traditional Apple Festival that was held in Guba regions, considered the “Heaven of Apples”. The Heydar Aliyev Park was full of dozens of farmers and gardeners who brought their best apples, including palmet, semerinka, fudji, gizilehmed and others to the outdoor event. The Park also hosted the 1st Carpet Festival on the same day. Azerbaijani carpets, being proclaimed a Masterpiece of Intangible Heritage by UNESCO in 2010, are renowned worldwide for their beautiful designs and vivid colors. Within the framework of the Festival, guests are told about the history and stages of the development of carpet weaving in the region. Sale of carpets was also organized within the event. To preserve national carpets and revive Azerbaijan’s weaving traditions, the state-run Azerkhalcha Company is constructing 10 branches in country’s regions and one of them will be opened in Guba. Guba region may rightly be considered as a motherland of Azerbaijani apples. Smell of juicy and aromatic apple trees have spread into every stone and every house of this beautiful northern region. Apple is a symbol of Guba, where almost everything is devoted to this juicy fruit. The sculpture dedicated to apple was erected at the entrance to the city. The people of Guba claim that there are more than 40 different varieties of apples there. Guba’s most famous kind of apple is the “White Apple” (Ag alma). One cannot satisfy his/her hunger trying this yellow, fragrant and red cheeked fruit. Azerbaijanis are so proud of this kind of apple that they wrote a song for it called “Guba’s White Apple”. And it is not surprisingly when you think that one-third of them are involved in the apple harvesting in some capacity. Guba, located in 168 km from the capital, is a favorite destination for local tourists from Baku for picnics and camping in the forest. While Guba welcomes tourists year-round, the most attractive season to travel to the region is in the autumn, when the smell of its famous sweet apples permeates the air. The number of tourists visiting the resort centers in Guba has doubled this year. The region recorded more than 50 percent increase in the number of foreign travelers. Only in August, the number of travelers coming to Guba was 17,300 people and 3,150 of them were citizens of foreign countries. Overall, the number of tourists visiting the region from the beginning of the year is over 100,000. The region has over 40 resort centers, all of which are trying to keep abreast with international standards on quality. During their stay, tourists have the opportunity to enjoy four exciting routes including the Guba-Khinalig, Guba-Afurja, Guba-Laza and Guba-Khanagah routes.